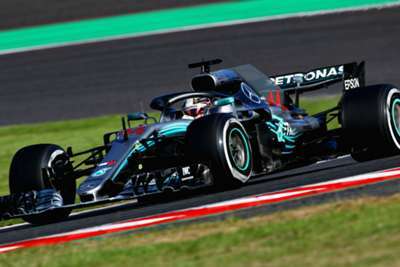 Mercedes driver Hamilton extended his advantage at the top of the standings to 67 points with his fourth successive race win and sixth in seven, with team-mate Valtteri Bottas taking second ahead of Red Bull's Max Verstappen. Vettel started eighth on the grid and worked his way up to fourth before contact with Verstappen, who had already received a five-second penalty for obstructing Kimi Raikkonen, on lap eight sent him all the way down to 19th. The gap between the German and Hamilton is now so big that the latter can potentially clinch the fifth title of his illustrious career at the United States Grand Prix. Hamilton claimed his 80th career pole position in Japan and never came under pressure at the front of the field on Sunday, the majority of the drama taking place behind him. Vettel's hopes of challenging the Briton were wiped away when he looked to dive down the inside of Verstappen at Spoon but connected with the Red Bull and both cars went off track. Verstappen's Red Bull team-mate Daniel Ricciardo enjoyed a fine day, climbing from 15th place after engine trouble in qualifying to finish ahead of the Ferrari duo in fourth. Things changed very quickly for Vettel and Hamilton. A safety car was deployed after Sauber's Charles Leclerc came together with Kevin Magnussen, resulting in debris close to the track and a puncture that forced the Haas driver to retire. The incident brought Vettel, who had climbed to fourth, much closer to Hamilton, but his attempt to pass Verstappen at turn 13 following the restart sent him spinning off track and brought his chances to an end. "The touch with Sebastian - in that corner you can't overtake. I even gave him space but he understeered into my car," said Verstappen after the race. Mercedes' dominance since 2015 is undoubted and Hamilton enjoyed another milestone in Suzuka. The victory was his 50th for the Silver Arrows – nine of which have come this season. It was also a second successive one-two after Bottas followed his team-mate home, as he did last time out in Russia. Fernando Alonso completed his 16,632nd F1 lap during the race, meaning only Michael Schumacher has completed more than him. Unfortunately, the McLaren driver, who finished 14th, has just four grands prix left in F1. After travelling from Europe to Asia for back-to-back races, the drivers have a weekend off before heading to a new continent for the United States Grand Prix.